Projects, regardless of the type, are usually deemed unsuccessful when things don’t go as planned and goals aren’t met. Contributing factors often include limited resources or role ambiguity among the team, as well we process and communication breakdowns. 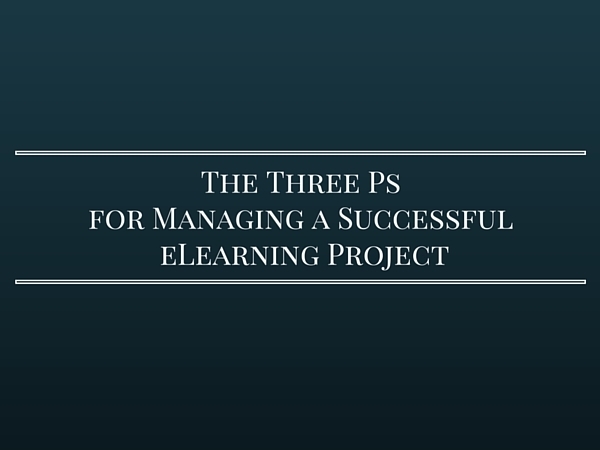 This post is the first in a series of three directed at managing a successful eLearning project by managing performance expectations, people, and the process as a whole. Today’s focus is: P = Performance. There are two ways to look at managing performance expectations: The performance outcome of the eLearning itself, and the performance of the team. To make sure performance is top-notch on both sides of the equation, it’s important to zero in on each of the following categories and ensure all of the bases are covered. First, take the time to spell out clear objectives for the course with goals that align to corporate strategy. Does the eLearning course help increase sales? Reduce errors in a process? Improve service? Your course should be built around a project charter with a core mission. Take time to figure out exactly what the learner needs to be able to do after completing the training. Once you identify the current gaps in knowledge or skills needed, you can better understand the level of engagement your learners need, how it should be visually appeal to a participant, and the quality and quantity of course content. You course should include engaging scenarios that help train individuals. How will you measure the success of the course? Use key business performance indicators (KPI) to measure the success of business goals. It’s a good idea to study these metrics on a regular basis to be sure success rates remain strong. Use formative and confirmative evaluations or tests to judge how well your eLearning course is meeting its behavioral learning objectives. Based on your goals, make sure the authoring tool and client’s delivery system can support the training functionality and reporting requirements. You might use a tool like Articulate Storyline or Studio 13, Captivate, or Lectura. You could also consider PowerPoint for a blended learning approach if you need live training via a webinar. A great course is based in learning—not on a tight budget. Many clients want a high-end course in terms of functionality, look, and feel on a low-end budget. Managing this expectation up front is critical to managing scope and performance expectations of the development team. More complex trainings will require more research, development, and time, but result in trainings that can be used year after year while being easily updated. No re-printing hard copy materials. Make sure there is ample time for development and delivery. While it might seem like an eLearning course can quickly be pulled together, there are many players involved and steps in the process that have to come together before you reach the finish line. Determine what skills are needed by the development team to produce the eLearning course as designed. Then make sure you have the right people on board. Establish standards and provide real-time feedback and keep the team focused on goals. Next week, we’ll discuss the second ‘P’ in the process: the People. Part two is all about who needs to be involved in eLearning course development and how you can better manage all of the moving parts that go in to an eLearning course.